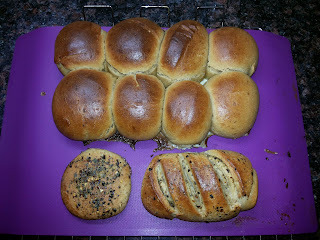 My first decent attempt at baking whole wheat bread at home with my 5 year old son for help. Hence the garlic bread roll in the pic is made BY him FOR him ! 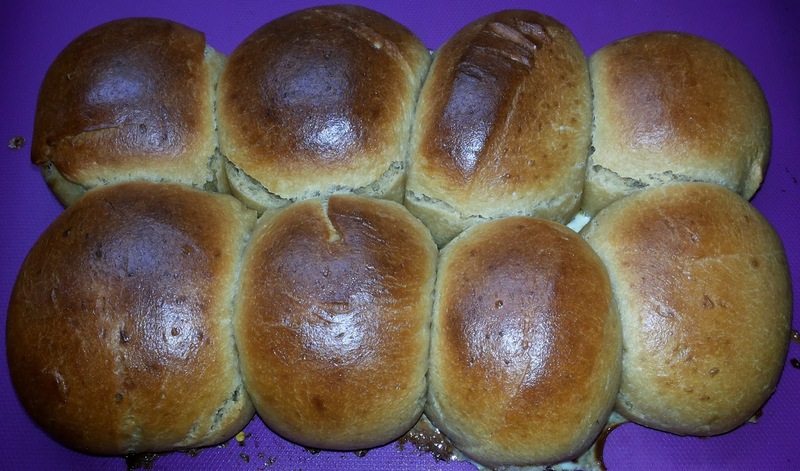 Fresh baked bread is a special treat, a delicious treasure of a home-cooked meal. Whole wheat flour is made from whole wheat grains. It’s good to use whole wheat flour as often as you can when baking for your family. But there’s one factor that deters many people from baking their bread with whole wheat flour alone – and that’s the resulting texture of the bread… it can be a little more dense than white bread. On a personal level, we rather like that density, but for those of you who like your bread a little lighter, can opt for all-purpose flour(Maida). To 1 cup warm water, add the sugar and stir until dissolved. Then sprinkle the yeast on top. Set aside until the mixture is frothy (around 10 mins). Mix the flour with the salt in a large bowl and make a well in the center. Pour in the olive oil. When the yeast mixture is ready, pour that in too, and then begin mixing everything together. Work the mixture into a firm dough, making sure that the sides of the bowl are clean. Add the remaining warm water as necessary to bring the mixture together. The dough should be soft and pliable to the touch but not sticky. Grease a large bowl, place the dough inside, cover with a damp kitchen towel and place in a warm place for at least an hour, until the dough has doubled in size. Once the dough has risen, turn it back out on to the floured surface, punch the air out of it and knead it for a minute more. 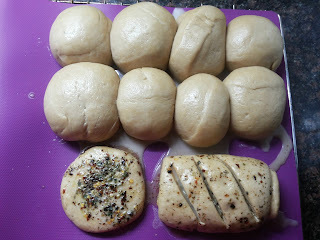 Flatten the dough and cut it into equal parts and shape them into balls. Place them in a baking tray and cover with plastic wrap/damp kitchen towel and leave it to rise for about 45 mins. Preheat the oven to 375 deg F (180 deg C). Prepare the egg wash for the bread by combining 1 egg with 1 tsp of water and mixing thoroughly. 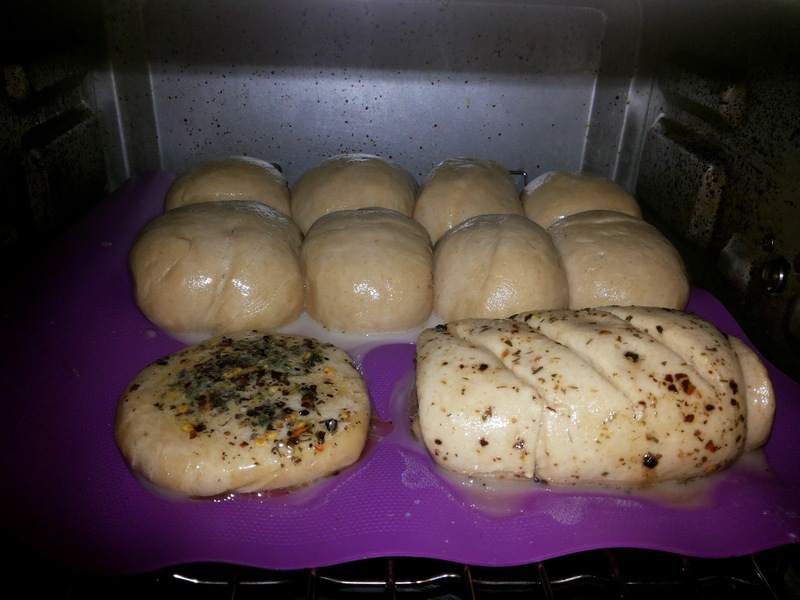 Remove the plastic wrap, coat the bread with egg wash and put the baking tray in the oven. Bake for 20 to 30 minutes until golden. Cool on a wire rack then serve! Ahhhh… the aroma of freshly baked bread is what makes this so much more worthwhile ! Enjoy the pav with your favorite Chicken curry or masaledar kheema !